﻿​﻿Betcoin is a global sportsbook that welcomes USA, Australian and UK sports bettors. 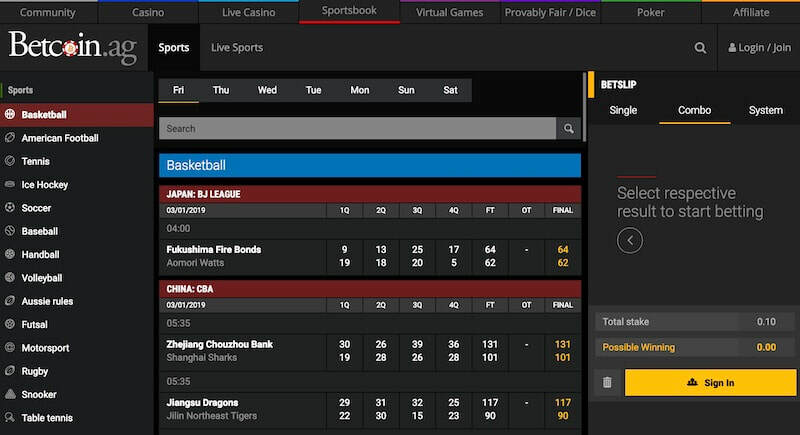 The newly revamped sportsbook is a huge improvement on their previous betting site. Live in-play betting available for EPL, UFC, NFL, NBA, NHL and other major leagues. Deposit instantly with Bitcoin, Litecoin, Monero, Ripple, Ethereum and other cryptos. Strong focus on E-Sports betting and on recreational gamblers rather than high-rollers. Betcoin are based in Costa Rica & are one of the most trusted btc gambling operators. 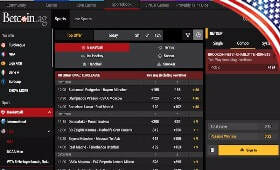 High quality mobile sportsbooks that offers all the same functionality as the website. Betcoin does NOT offer any sports betting deposit bonuses or promotions. The Betcoin platform was originally created in 2013, and from the beginning they’ve been dedicated to creating a safe place for cryptocurrency enthusiasts to gamble online. They are a crypto only casino, and you can bet using a large variety of currencies including Bitcoin, Ethereum, Litecoin, Bitcoin Cash, Monero, Iota, Cardano and Dash! They might possibly offer more cryptocurrencies than any other sportsbook, which typically tend to stick to Bitcoin or Ethereum. They also offer a huge number of gambling options, including their sports book which allows crypto gamblers to place wagers on a number of events and sports such as MMA, boxing, basketball, rugby, badminton and more. Betcoin has a lot to offer, and if you’re looking for a great cryptocurrency sportsbook, then this should be one of your first stops. Particularly if you’re interested in anonymous sports betting. Betcoin offers an attractive layout that’s easy to use. Their quick links allow you to easily navigate to different sports, and their intuitive filters make it easy to find matches that fit your needs. This includes allowing you to choose matches based on betting types and even a particular day of the week! Sort matches by tournaments or time to get in on exactly the games that you want and the timeframe that you want to bet in. This makes it extremely convenient to be around exactly when a particular match is happening so you can adjust your wagers on the fly. When it comes to creating an account, Betcoin makes everything extremely simple. All you’ll need is an email address and to create a username to get started. You’ll then get a welcome email that can help you to continue with your account creation. Betcoin does not ask for any other information from you, and they allow anonymous betting. However, if you look in their terms of service they do “reserve the right” to ask for identity verification. Whether they will or not is impossible to know until they ask unfortunately. If you wish to remain anonymous then your best bet is to stick to smaller withdrawals which will be less likely to trigger an account audit. Betcoin also allows for 2Fa authentication for security, and it’s highly recommended that you use it. It’s very easy to get your email address stolen, and if it is your cryptocurrency will likely be long gone before you can do anything about it. 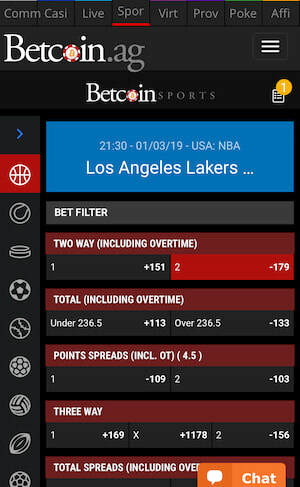 If you’re interested in placing your wagers on Android or iPhone then you’ll be glad to know that Betcoin’s sportsbook also has a very nice mobile application. The interface is quick loading and easy to navigate, and you’ll be able to do everything you need to do from your phone. The sidebar offers some nice quick links to help you browse through the different sports, and quickly place your wagers with just a couple of clicks. You can also access the live sports options from the mobile site, and even view a feed of everything that’s been going on for the game thus far. This makes it easy to keep tabs on your wagers if you need to run out for some errands. Unfortunately, the information feed is a bit stripped down when compared to the desktop version which is much nicer. The only bad thing about the mobile site? While everything functions nicely, a few things are a little cramped on your screen. They have a live chat for support readily available, which is great, but it kind of intrudes on part of your screen in some areas unfortunately. As does the “language selector” button. Otherwise, the mobile gaming experience is great, and this is only a small inconvenience to deal with. It does not impact your ability to place bets at all. Betcoin offers a wide variety of sports, including live ones which you can participate in. While they don’t really offer anything fantastic in this regard when compared to other sports betting sites, they do offer some excellent filtering options. What does this mean exactly? Well, it means that it’s easier to actually find what you’re looking for. 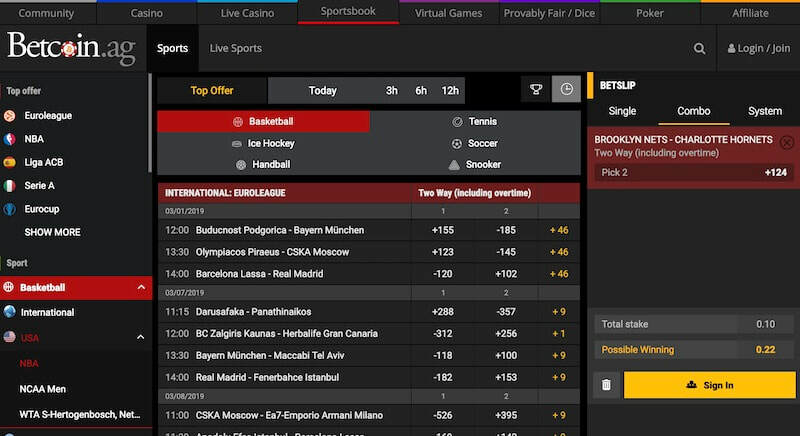 You can quickly filter by time, tournament, day of the week and other criteria which other sportsbooks are missing. However, Betcoin does offer a decent amount of sports options, and you’ll be able to participate in all the usuals like basketball, tennis, hockey, soccer, esports, rugby, etc. Their betting types aren’t as robust as some other books, but they still offer enough options that most bettors will be happy with them. This includes outrights, 3 way bets, Asian handicaps and system bets, which allow you to combine a bunch of parlays together. Betcoin doesn’t come right out and say what your betting limits are though, and you’ll need to test them for each bet, which is kind of annoying. If you’re past your betting limit then it will just tell you to choose something within the range. If you’d prefer to place your bets when the action is happening then you can also take advantage of Betcoin’s live betting options. By clicking on ‘Live Sports’ you’ll be directed to the matches that are taking place right now. Again, their filtering is excellent, and it’s super easy to narrow down the selections to exactly the kind of match you want. Filter by sport, league, event and more to find the perfect match. 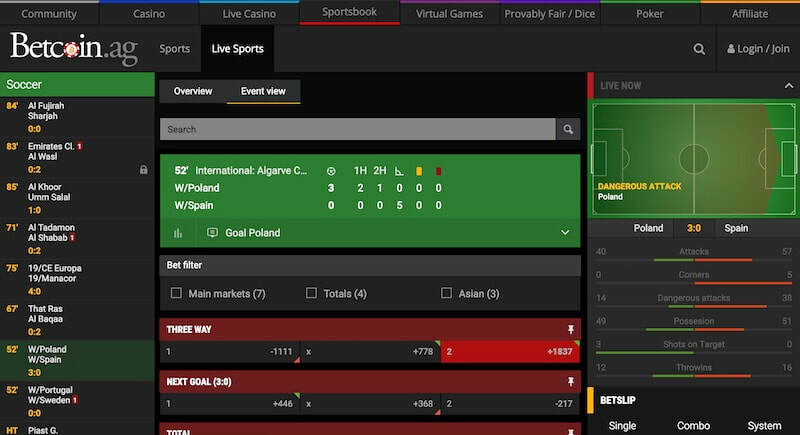 The main screen will give you a quick overview of the matches in progress, and it even provides an odds table that lets you know the predicted outcome of the match. All of this will be updated in real-time as the game goes on. They also have available some great charts which let you know about what has happened during the match already and even some cool diagrams showing who is in control of the ball and what’s going on. Unfortunately, it seems that these have mostly been cut on the mobile site which is disappointing. 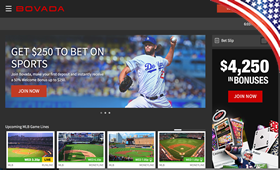 While their live betting is pretty good, it’s definitely better on the desktop site, and if you’re a mobile only bettor then you could be missing out on some great features on mobile here. At this time Betcoin does not offer horse racing or any racing sports books other than cycling. Interested in some fun casino games to pass the time between matches? Betcoin also has some great casino and poker options that you can take advantage of. They’ve got a wide variety of games available including video slot machines, table games, live casino options and provably fair gambling opportunities. All of these are flash based games, and you’ll need to have a device capable of using it to play them. Some browsers or devices could present problems here unfortunately. However, the games do look nice, and free play is enabled so you can try before you buy. Betcoin is a cryptocurrency only platform, and that means you’ll need to have some already to play here. It’s easy enough to buy some using a number of different sites such as Coinbase, just make sure to use a pass through wallet to send your money to the casino. Some sites like Coinbase don’t like you using your cryptocurrency for gambling, and if they figure out that’s where you’re sending it your account could be shut down. One of the best things about Betcoin is their flexibility when it comes to withdrawals and deposits. Their minimums are very low, and they actually have no maximum withdrawal. However, you should be aware that large withdrawals could cause suspicion, and you might be forced to verify your identity before they are approved. There are several ways to get support at Betcoin. This includes an extensive FAQ, support ticket system, email, and a live chat option. You can also access all of these options using the mobile site which is nice, and they make it easy to find support, unlike other providers who have a bad habit of hiding the support options. Betcoin offers tons of resources to new sports bettors, and that’s good news for you. Support is available 24/7 so if there’s a problem with your account you don’t have to worry about waiting around for a solution. This greatly improves security because accounts can be locked instantly to prevent theft. Betcoin doesn’t offer quite as many promotions as other services, but they do have one pretty good one. Plus, unlike other casinos, Betcoin doesn’t make you jump through hoops or perform any complicated tricks to claim your bonuses. There’s actually three of these, and you can claim all of them. Your first deposit will get a 100% bonus, your second deposit will get a 50% bonus, and your third deposit will get a 25% bonus. Unlike other casinos which make you earn your bonuses over a prolonged period of time, with Betcoin you’ll be credited with these bonuses immediately. There are a couple of rules though. Unfortunately, Betcoin doesn’t seem to have any bonuses available for the sportsbook. This puts them at a bit of a disadvantage when compared to other sports betting sites. Betcoin offers an excellent platform for cryptocurrency sports betting. They’ve got great filtering options and excellent resources for live betting that make wagering more exciting. They’ve also got excellent resources to help you master the platform. Their bonuses are straightforward and without any gotchas, and their support network and security features are dependable. This makes them an awesome site to place your wagers on, and one that you can depend on. 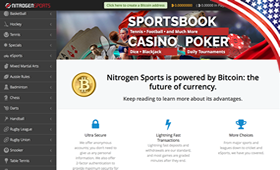 Betcoin features exceptional usability and it has a fantastic sports book to go with it. If you want to bet using crypto, then this should be one of your go to sites.